US, 1937, 90 minutes, Black and white. Irene Dunne, Cary Grant, Ralph Bellamy, Alexander D' Arcy, Cecil Cunningham, Molly Lamont, Esther Dale, Joyce Compton. Directed by Leo Mc Carey. The Awful Truth is one of the best of the screwball comedies of the '30s. It was directed by Leo Mc Carey (Duck Soup, Make Way for Tomorrow, Going My Way, etc.). He won the Oscar for best direction in 1937. Cary Grant appeared in many of this kind of film, especially the climax in The Philadelphia Story. Irene Dunne was also an adept comedienne - Theodora Goes Wild, My Favorite Wife. Ralph Bellamy made a career of this kind of sappy chap from Oklahoma (he and Irene Dunne received Oscar nominations). The film is in the vein of the idle rich, marriage, misunderstandings and divorce, reconciliation. In fact, the plot is almost identical with the later My Favorite Wife. 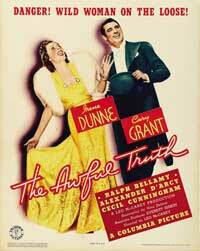 The film has humour, farcical situations, impersonations by Irene Dunne - all in good humour. It is interesting to think of this kind of comedy as so popular in the depressed ,'30s. 1. The popularity of screwball comedy, the '30s? The idle rich, marriage and divorce, reconciliation? 2. Oscar nominations and awards? Black and white photography, the stars and their sophisticated style? Musical score? The presuppositions of the '30s: the life of the rich, not having to work, stylish? Bases for marriage, separations and divorce? Frivolous atmosphere? Reconciliation? 3. The title and its ironies, froth, wit, deceptions? The comedy of manners, drawing-rooms? Imitations? 4. Jerry returning from Florida, deceiving Lucy, Lucy and Armand and the music lessons, the scene with their guests, the antagonism, decision for divorce? Their separate adventures, the reversing of the decision? 5. Cary Grant and Jerry's style: suave, his belief in his wife, relationship with Lucy, the shock of the divorce? Meeting Dan, his mockery, upsetting his mother, the restaurant sequence and the dancing, paying the orchestra? His bumbling into the concert, his apology, insinuating ideas about Lucy? Hiding in the room with Armand? The engagement to Barbara, high society? Lucy answering the phone, her impersonation of his sister? Together again? 6. Lucy, Armand and her glamour, music lessons, irritation with Jerry, the divorce? Meeting Dan, his mother? Oklahoma, the outings, the stylish dancing? Jerry's insinuations? Having to hide both Armand and Jerry? Antagonism towards Barbara, imitating her sister - and doing the song and dance routine? Engineering the ending, the encounter with the police, the car, the motor bikes, Aunt Patsy's, the reconciliation? 7. Dan and his mother, a mother as a man's best friend! Oklahoma, ingenuous, courtesy, dancing, deceived, his horror at being deceived? The character of his mother? 8. Barbara and high society, proper, her phone calls and suspicions, the family's reaction to Lucy's impersonation of Lola and her dance? 9. Armand, the foreign music teacher, the compromising situation, Jerry's suspicions, bursting in on the concert, Armand helping Lucy out, hiding the two men - and the comedy with the hat? 10. Aunt Patsy, her observations, help? 11. The style of the '30s, values, charm, risque subject and treatment, moral resolution?